QUICK SALE at only 5,950,000 THB!! This large 5 bedroom pool villa is located in a small village, Park View Court. This village is located in peaceful location and not far from Highway no. 36 & 7. - 5 bedrooms (2 en-suite bedrooms with bathtubs) & 3 bathrooms come with built-in closets. Walk-in closet in master en-suite bedroom. - Large lounge area overlooking swimming pool. - Utility room with lot of cabinets. - Maid's quarters with private bathroom. - Outdoor living area with counter bar & toilet by the pool. - Spacious empty plot where can built another house on. 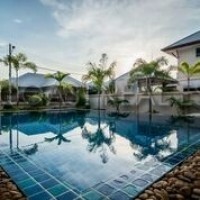 This property is for SALE under Thai Company, inexpensive and easy to transfer to new owner.